First, a little backstory to explain why I came here, of all places. There are no direct flights from Toronto to Stockholm. They all connect somewhere in continental Europe: Copenhagen, Frankfurt… or, in my case, Helsinki. 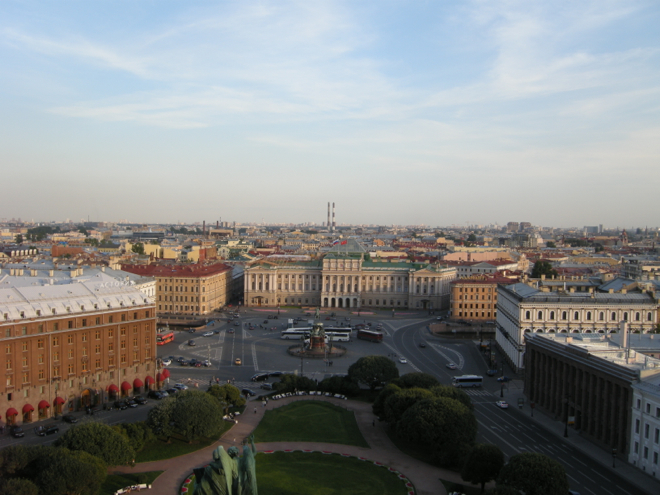 I found a particularly cheap ticket through Finnair, and remembered that Helsinki is a sort of “gateway to the Baltics”: particularly, St Petersburg and Tallinn. I had visited both these cities a long time ago, back in 1996 when I worked as a bass player on the Princess Cruise Line. So, in typical Dylan fashion, I managed to leverage a “layover” in Helsinki into a 10-day sidetrip, all on a single flight booking (with a couple of trains and ferries in between). My trips to St. Petersburg in 1996 were memorable. Since I worked on the ship, I couldn’t stay long: just a few hours each time. 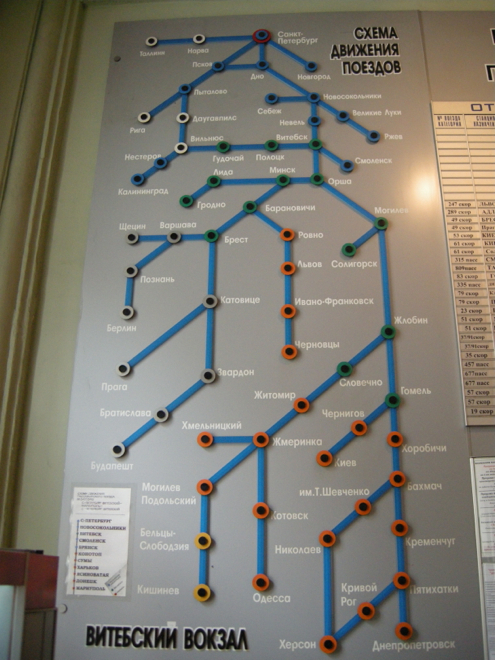 But I managed to stumble around the city without a map, smuggle myself into a tour group, get lost on the subway, and hitchhike back to the ship with the help of a few words scrawled in Cyrillic letters on a piece of paper. Ah, the fearlessness of youth! My experiences this time, at the age of 40 and with a GPS-enabled map on my iPhone, were less risky, but more culturally-rewarding. It seems St. Petersburg always brings out the scam-artist in me. In 1996, I circumvented the outrageously-expensive, Mafia-controlled taxicab racket with the aforementioned self-smuggling and hitchhiking. This time, I snuck into First Class on the high-speed train from Helsinki to St. P. Affecting an aura of indifference-born-of-entitlement, I managed to stay there even after my ticket was checked. A fine start. When I first visited in 1996, Russia was barely out of the shadow of the old Soviet Union, which had dissolved a short five years before. It essentially felt like the Wild West: organized crime was open and rampant, English (spoken or written) was nonexistent, and the whole place had this elegant ramshackle-ness about it. Trundling down the ancient trolley tracks, it was clear that nobody was really minding the store anymore… assuming they ever had been. Today, it feels a little different… but not entirely. The whole place feels more cleaned-up and a less openly crime-y. More like a typical European city. English is still hard to come by compared to most of Europe, and its use in signage is arbitrary and not particularly helpful. You might see a “please mind the doors” sign, but nothing to indicate how to buy a rail ticket, for example. And while they may have adopted the free market, they certainly haven’t adopted the concept of “customer service”. In the old days, the mentality was two-way, thanks to the relative poverty of the country. The working deal was “we pretend to work, and you pretend to pay us”. And when there was a state monopoly on everything, and a guaranteed job for everyone, there was hardly any motivation to work hard. It wasn’t like you had anywhere else to buy what you wanted… and they weren’t going to get fired anyway! нет … Вы заказали вегетарианские суши! нет … Вы заказали вегетарианские суши. Yes, it was my mistake. But I’m from the land of “the customer is always right”. If I was an entitled American tourist (sorry, American friends, but you know the type…) I would have raised a fuss, demanded to speak to a manager, or something. But, I’m Canadian. First off, I’m a guest in someone else’s house, so to speak. Second, I know better than to challenge a national mindset all on my own. Third, badly-designed menu or not, it was still my mistake. And she wasn’t letting me off the hook. нет. No way. So, I ordered… again. Good thing I was hungry… I ate the veg sushi while waiting for the next order. Between the miserable cold/infection, and the 12-hour travel day, I was beat. I slept for 13 hours! By the time I ate, caught up on emails, and felt fit to go outside, it was already 4:30pm. I figured I’d lost most of the day. Turns out I was wrong. I just did the late shift. Fortunately, this far north, the sun sets around 10pm, and many attractions seem to stay open late for summer hours. So, I managed to get a full day in. I started with a walk on Nevsky Prospekt, St. Petersburg’s main thoroughfare. 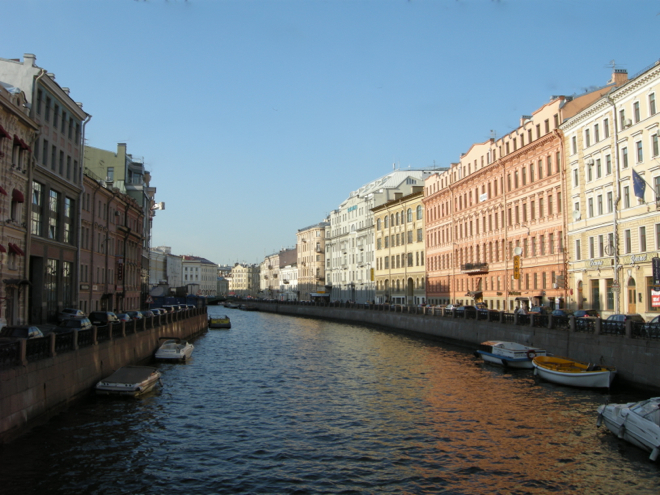 Being a comparatively young city (by European standards, anyways), St. Petersburg is designed in the manner of 19th-century European “re-development”: long, wide streets, in grand-boulevard fashion. And here, there’s traffic to match. It was a beautiful, sunny day, perfect for walking. Along the Prospekt, I saw a crowd gathering around a street performance. 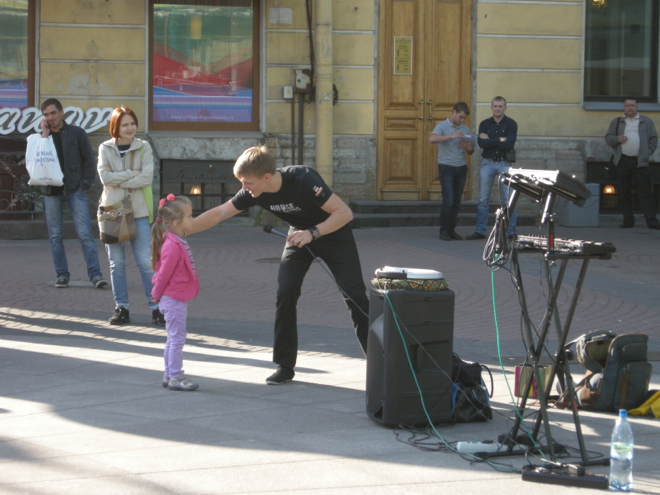 But not just any street performance: a beatboxer, working with a loopstation. Pretty much exactly the same type of thing I was doing in Stockholm, and not the kind of thing you see every day. A remarkable coincidence. I chatted with the guy on his break, and gave him my card. He was quite talented. Onwards to a scenic canal. St Petersburg is also known as the “Venice of the North”, and while it’s not quite as stunning as the real thing, nor the canals as prevalent, it has its moments. Whenever I go to a new place, I spend hours just walking around. It’s a holdover from my days on the cruise ship, where we’d stop in some picturesque city and I’d have a few scant hours to check it out before getting back on the ship to play. It’s really the best way to get to know a place. I probably see fewer sights-per-day than the average tourist; but while the tourist shuttles about in a bus, losing time in-transit while getting to each Important Place, I’m on the ground, moving at a human pace, and every moment counts as sightseeing. Plus, you stumble upon interesting things. In my case, I was heading towards a noteworthy church, and stumbled upon a beautiful park in the meantime. Try doing that on a tourbus! 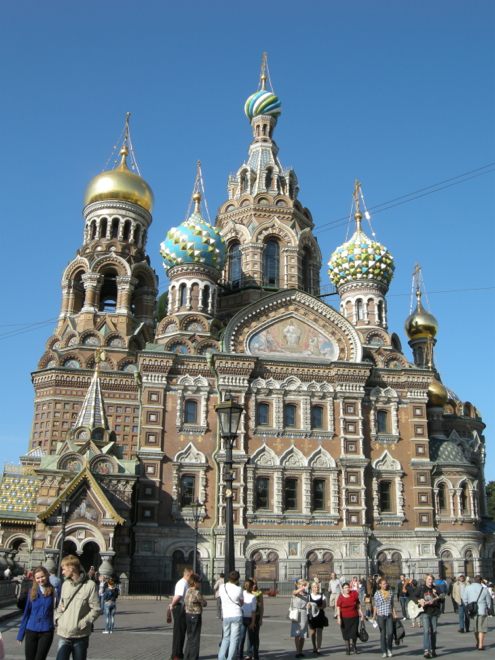 The “noteworthy church” was the Saviour on Spilled Blood: a beautiful church with a grotesque name. And while Christians love their blood imagery, this blood belongs to someone else: the church was built on the spot where Czar Alexander II was executed. Delightful. There are lots of pictures of this stunning church, too many to add here. Check out my Saint Petersburg Photo Gallery for a more in-depth visual representation of the trip. 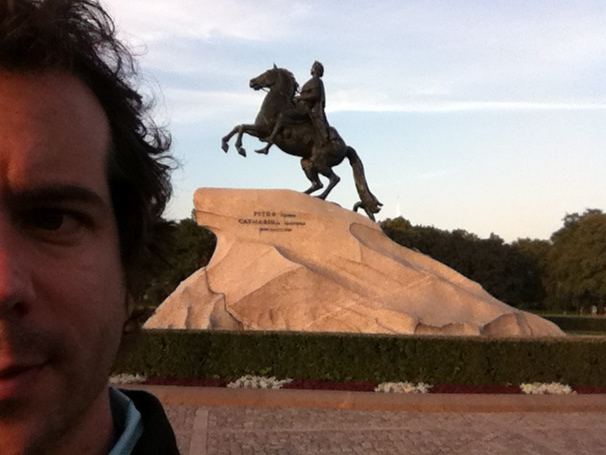 Onwards to the famous statue of Peter the Great, commissioned by Catherine the Great. 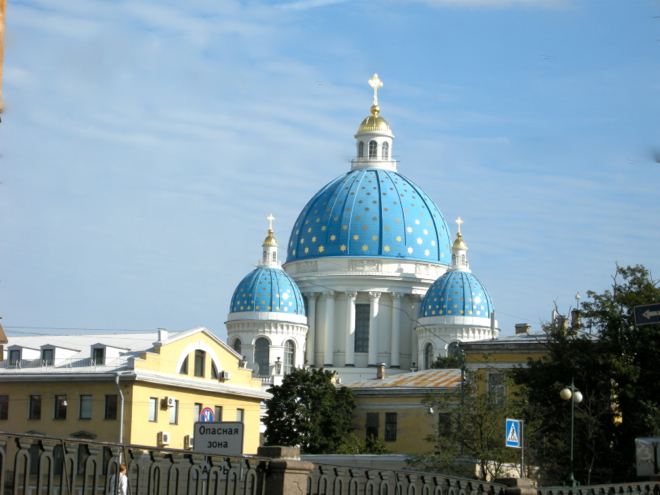 From there, on to St Isaac’s Cathedral. It was near closing time, so I had a choice: check out the museum inside, or climb the Colonnade for views of the city. I chose the latter. I also ran across this sign. Open to multiple interpretations. 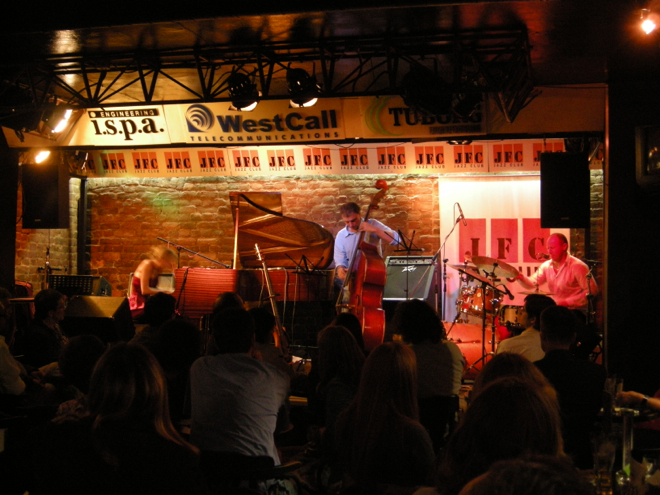 I had done a little research before I headed out, and decided to see some jazz at a club not far away. 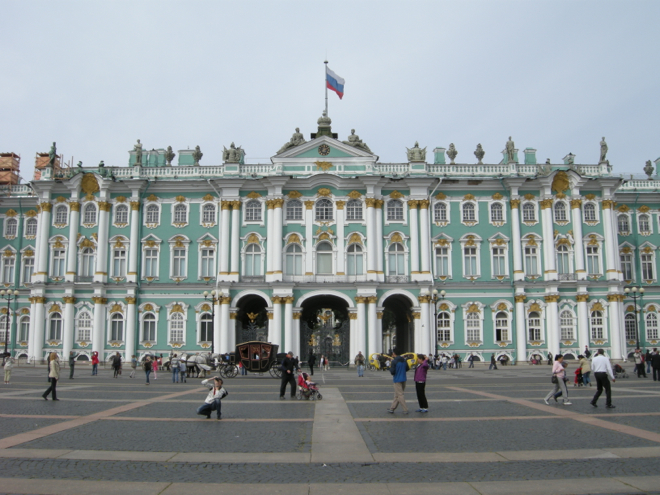 It worked out nicely: to get there, I passed by the Summer Palace, home of one of the world’s greatest museums, the Hermitage. 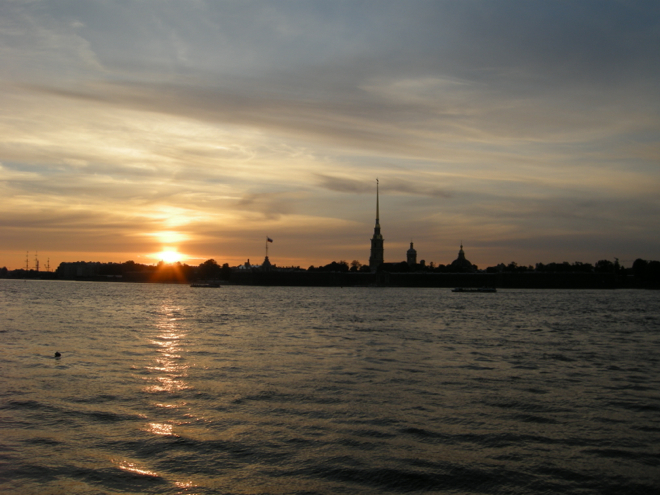 And my timing was perfect, as I got to enjoy sunset while walking along the Neva river. I concluded my evening with a little jazz. I didn’t get the name of the group, but they were fantastic. I caught the last half-hour or so of their set. I didn’t know what it was…. But I knew I had to buy it. 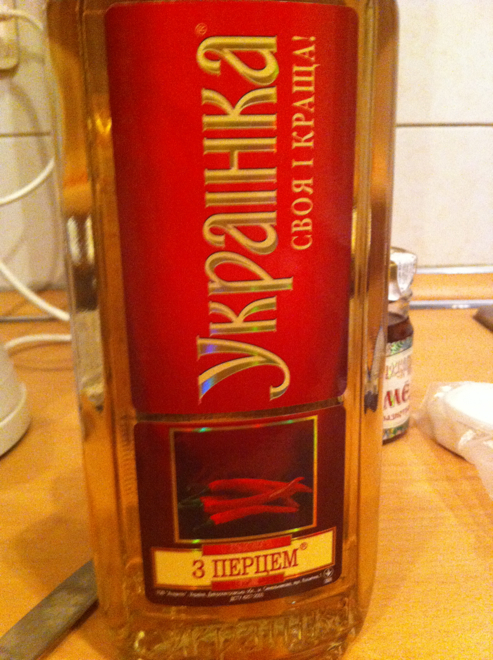 Chili and alcohol… my two favourite food groups, merged into one! Turns out it was chili-infused vodka, and it was delicious. Not only that, but I had been on a nightly regimen of “cold-busting tea”: hot water, lemon, honey, and oil of oregano. A shot or two of this stuff added did the trick nicely. I’m pretty sure it’s medicinal. My agenda today was to go on a canal tour. Despite the prevalence of boats out there, it was harder than I expected. 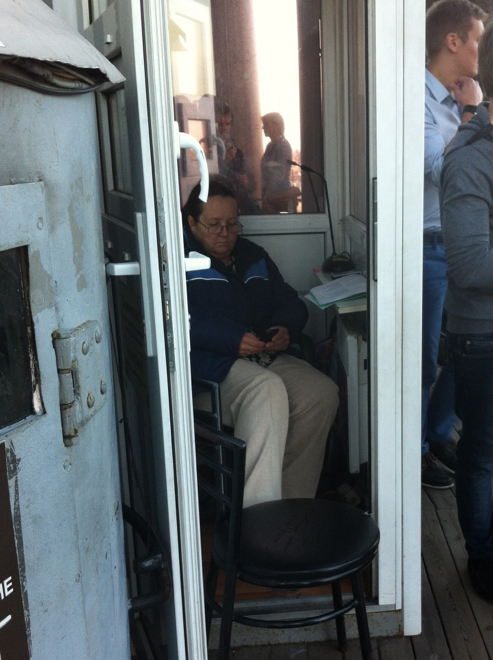 I suppose I had assumed that, being primarily for tourists, It would be easy to find a boat with English commentary. 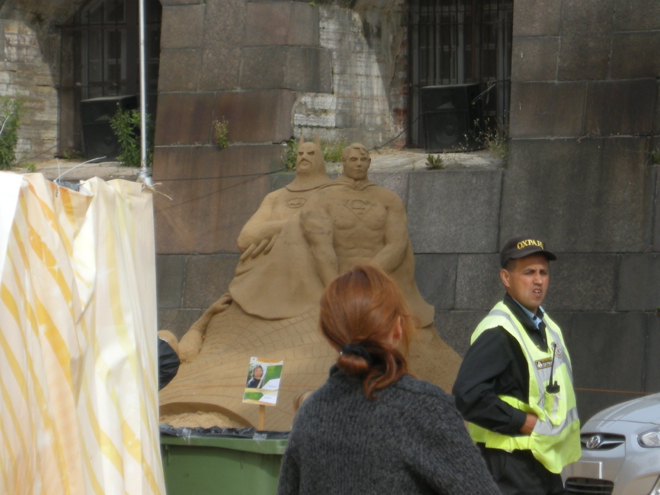 … modeled out of sand, at the beach in front of the fortress. Nice. Back to the boat-tour-place. After waiting through the afternoon for this, I was quite excited, and ordered a ticket for the English tour. – Hey… what can you do? – I do have an idea… but why would I tell you? Having learned the lesson from my first night, I decided to take the tour anyway. I didn’t learn much about all the buildings I saw, but it was lovely anyways. I’m sure this building is very important. Half the fun of learning about a place is to learn it firsthand, from someone who lives there. There are all sorts of little insights, and unique perspectives, you can only get from a local. I didn’t know anybody here in St. P, but was fortunate enough to strike up a conversation with someone in a café. She lived and worked in St. Petersburg, but was from Odessa, in the Ukraine. Being close to my age, she grew up in the Soviet era thus had interesting impressions of both the pre- and post-Soviet era. History was my minor in university (including a course in Russian history), so this little conversation was quite interesting for me. I’m a pretty smiley guy. Normally it’s quite an asset: nearly everywhere in the world, a smile breaks down barriers, disarms people, and spreads a little happiness around. First of all, people rarely smile, in general at least as they go about their day. And if you smile at them…. nothing. It’s like smiling at a brick wall. So, I started thinking about it. I suppose, given their history, it’s not surprising. In North America, we’re a pretty trusting lot, overall. Most have (some) faith in government, at least to the point that we don’t think it’s completely corrupt. We generally assume that we’re not out to scam each other on a daily basis. But in Russia, they went from tyrannical czars, to Soviet totalitarianism, to a nominal “democracy” in which elections are suspect, and three women were recently jailed for staging a protest in a church. And in the freewheeling early post-Soviet days, many citizens were robbed blind in pyramid scams and other such things. I did a little web research, and sure enough, found this interesting article. A friend told me that it has to do with trust, and familiarity. There’s no “polite smile” here: that would be interpreted as insincere. If they know you, and trust you, they’ll smile. There’s a Russian saying: “a smile isn’t for everybody”. Sounds like a a good name for a children’s song, don’t you think? Everybody sing along with Yorgi! 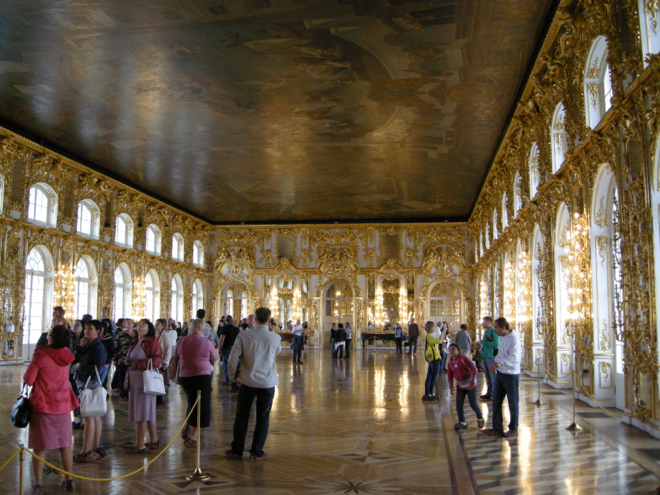 The next day, I thought I’d check out Catherine Palace, a ways outside of town. 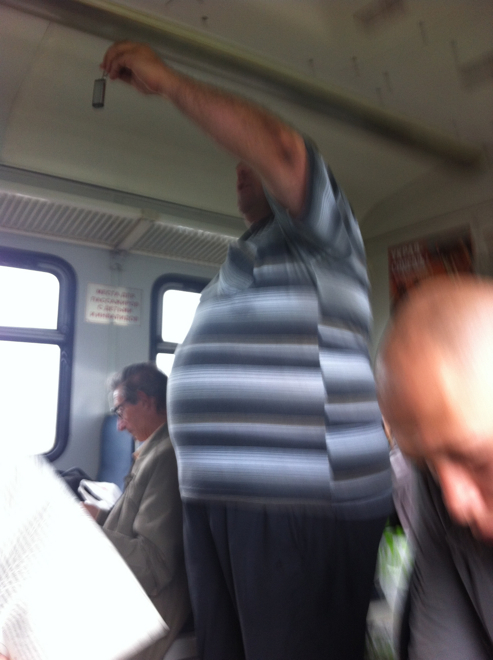 And as I usually do, I thought I’d take public transit. In this case, a commuter train and a short bus. I dutifully wrote my directions on my laptop, ready to sync them up to my trusty iPhone. So, I got to the train station, only to realize I didn’t really know where to go. Rather than retrace my steps, though, I thought I’d make it an Adventure. Part of the fun of traveling (at least for me) is the constant puzzle-solving that goes along with getting around and getting by. I was pretty sure I remembered vaguely where it was, and what the name looked like. And if I got lost, well, at least I’d have a story. Second, there’s the Cyrillic alphabet to deal with, where the letters you think you know the sound of, you don’t, and there’s no telling what the other wacky letters mean. Even if you read the name of the place in a book, it was probably in Roman script. So our favourite word, “Nyet”, looks like нет. Saint Petersburg looks like this: Санкт-Петербург. Confused yet? so at least I wouldn’t find myself on the 64-hour train to Варна. 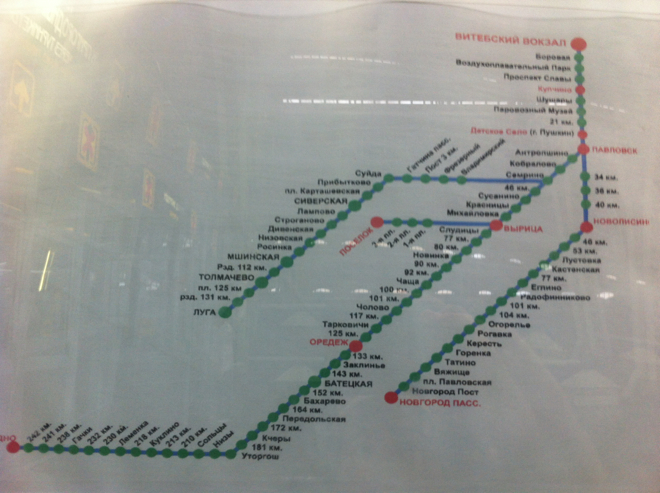 I then found what appeared to be the suburban train map. Good news: if I was correct about the station when I thought I was supposed to get off, it appeared that every train went through there. All roads led to Царское Село, so to speak. I decided to take a picture of the map to follow along as I got on the train. Assuming I could actually get a ticket. The machines, of course, were all in Russian. What was a one-way verses round trip? How did I find the name of my station? After a few minutes of valiant finger-stabbing on the little screen, it spit out a little ticket which appeared to have the name of the station I presumed was correct. written on the window. Success! Equally amazing was the fact that most of what I saw was a postwar restoration. The Nazis had occupied the nearby town of Pushkin and almost completely destroyed the building with shelling and fire. The restoration team, using 19thC photos, painstaking restored everything using historically-accurate building and finishing techniques. Amazing. Here’s one example: check out the photo gallery for more. 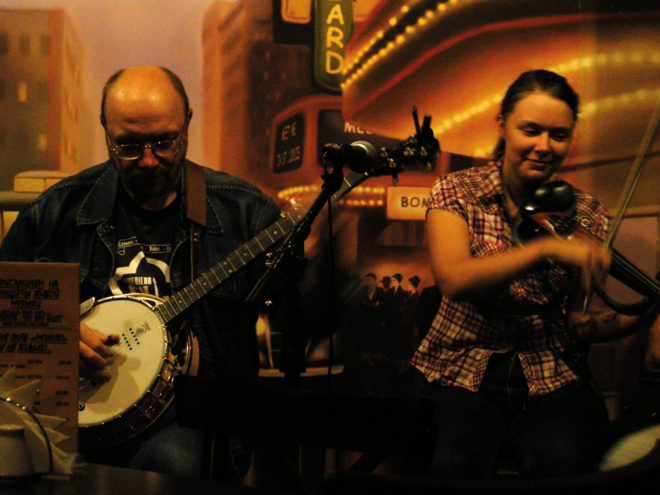 That is, American bluegrass, played by Russians. And played very well. These guys knew their stuff, and the banjo player rocked in particular. Great rendition of “Country Roads”, which for me always brings back memories of long roadtrips as a kid, in my parents’ VW bus (I guess this whole travel thing for me started early). They ended with “Ring of Fire”. A jolly (if somewhat surreal) end to my final night in St. P.
I love cemeteries: very quiet and peaceful, with beautiful trees and landscaping. 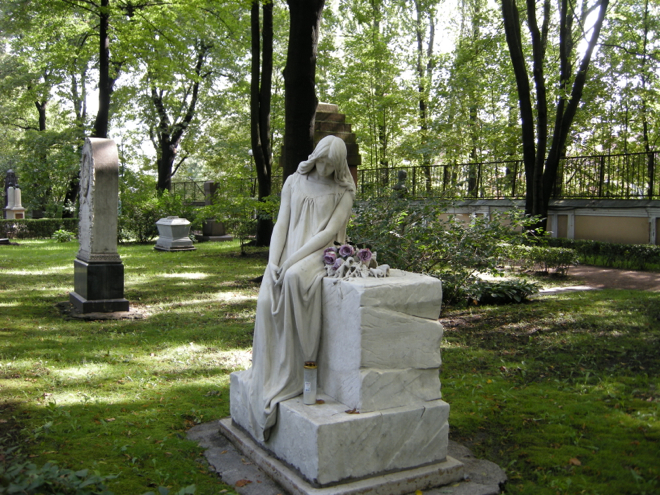 Well, this one wasn’t just any cemetery… it was a special one for Russia’s greatest artists! Everyone’s there, from Dostoyevski, to Tchaikovsky, to Rimsky-Korsakov. It must be quite a party when the sightseers leave at night. Well, I’m off to Tallinn now. Stay tuned for the next adventure!